The Stanley Baby Ribbit has all the action of the standard Ribbit, but in a smaller size. A Ribbit is 4 inches long and the Baby is 3.5 inches. 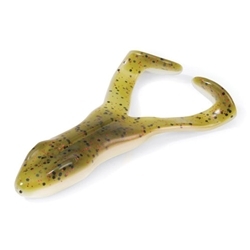 It combines the action of a topwater with a weedless design for those hard to fish spots.Garlic Scented. 6 count packages.